How big (or small) can a walk-in be? Click on the links above to go straight to the answer. Generally, any closet that you literally walk into is considered a walk-in closet. In general, you need to walk in the closet in order to access items. 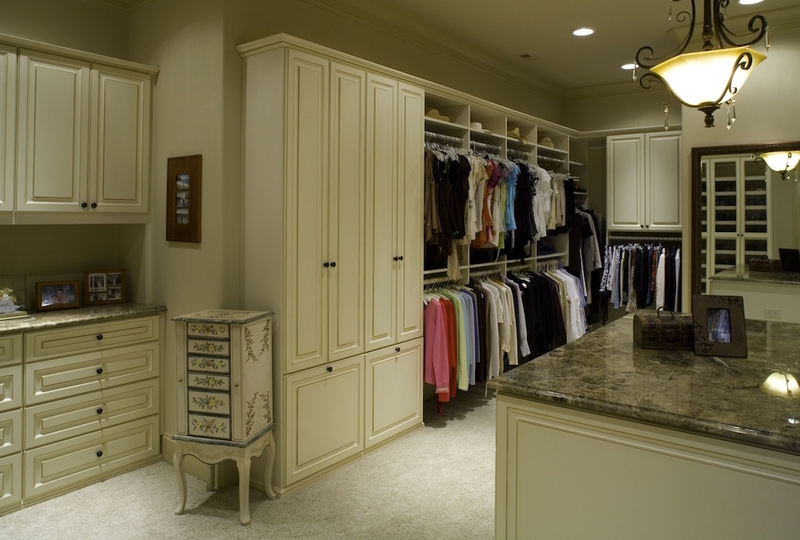 In most cases, the entrance to a walk-in closet is accessed from an adjoining bathroom or bedroom. Walk-in closets come in a huge variety of sizes and shapes and may even have sloping or angled ceilings or walls. Reach-in closets tend to be accessed by opening the doors to the closet where you can access items right away. Most children’s and coat closets tend to be a reach-in. A walk-in usually starts at 4 feet wide by 4 feet deep. This allows space for hanging areas, cabinets, and shelving. The room dimensions for a walk-in go up from there, but typically they are at least 6 feet wide and 8 feet deep. Keep in mind that if you want certain features, like a closet island, you may need to allow additional space for a pathway. Reach-in closets like coat closets can be a couple of feet wide by three feet deep. For reach-ins with bi-fold closet doors, they can be five to six feet wide and about three feet deep. These are very general rules. We encourage you to reach out to a designer who will be able to take accurate measurements of your space and provide you with a whole list of options for your space. The cost of a custom closet unit is dependent on many factors including, size, cabinetry options, style options, finishes, and more. Many of our clients have found that our prices are competitive and are even cheaper than a big box home improvement store considering the benefits we offer including professional installation and lifetime warranties*. Projects can range from a couple of hundred dollars to thousands of dollars. Our team will provide all the details you need to know during your free, no obligation in-home estimate so you know exactly what to expect in terms of timelines and cost. Yes! Going with a custom closet design is the perfect way to ensure that you have the features you want to help you get organized. Each and every one of the projects we take on are customized for each application. No matter if you need additional hanging areas or more shelving, our team is here to design, manufacture, and install a perfect closet for you! Find a store near you to schedule your free in-home estimate and see how we make it easy to Make Room for Life®. Closet & Storage Concepts is the leading custom closet and home storage furnishings expert with over 30 years of experience. We have locations throughout North America to provide you with a one-of-a-kind customer experience.